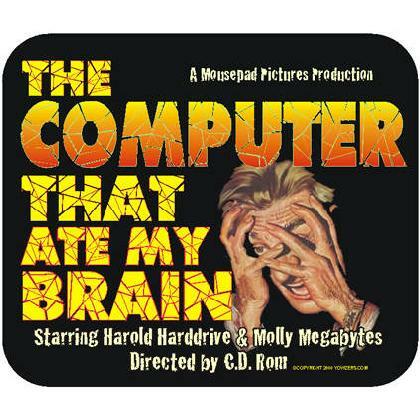 Getting a little frustrated with the whole computer thing...well this mousepad may be for you. 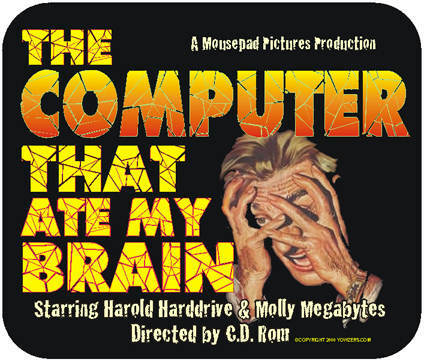 "The Computer That Ate My Brain" printed on a quality 9 1/4" x 7 3/4" x 1/4" mousepad is for those of us trying to get a grip on todays computer world and keep up with the fast moving world of technology. Remember to keep a sense a humor since we will be laughing about todays computers tomorrow.